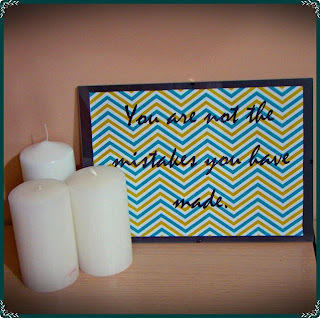 Pretty Elements: Chevron Wall Art..for free! I am pretty excited to start this new adventure with my blog – a space I have dreamt of for a long time :). And.. What's better than the trendy “Chevron” pattern to start with? If you like Chevron patterns, I highly recommend you to check the other versions at Doodlecraft :) They’re free and a-m-a-z-i-n-g!!!! Since I’m no professional designer nor a photoshop amateur, I tried to work with the tools I had... cough cough...meaning Microsoft Office [I know, I should be ashamed of myself but wait to see the result!!]. I have copied the pattern on a Word file and created a text box. That was easy peasy, but then I started to check fonts.. and there I spent almost 2 hours because I couldn't take a decision! Finally, the font I used is "Brush Script MT" and I still like it a lot. When I feel down I look at the picture and I feel much better and in peace. We do make mistakes, we can’t change this, but we learn from them and we can become better people day by day – mistakes do not determine our personality. What about you? Are you passionate about chevron patterns? Do you have a favourite statement that helps you relax and find peace?